Highly regarded thoroughbred racing photographer Steve Hart has joined with the Australian Turf Club to capture some of Australia’s greatest jockeys in a special piece of racing history. Hart will raise funds for the National Jockeys Trust from signed copies of limited edition photographs taken in front of the restored chronometer inside the Heritage Gallery at Royal Randwick. 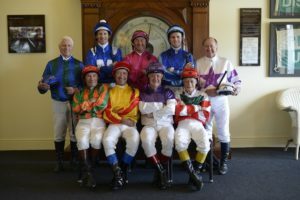 Among the former and current jockeys featured in the photograph are: Tommy Berry, Hugh Bowman, Malcolm Johnston, Ron Quinton, Darren Beadman, Kevin Langby, Billy Camer, Clark Little and Kevin Moses. Jockeys wore the silks from horses that shared some of their biggest and most memorable wins on the racetrack, or for trainers they rode for regularly. Clark Little, who had many famous wins on Pirate Bird, stood in for Ray Selkrig and wore the silks of Lord Fury, winner of the 1961 Melbourne Cup. Hart said he wanted to capture some of the history of Australian racing with a variety of its past and present jockeys. “We were very grateful to get so many jockeys for the one shoot from different parts of the country, including Tommy and Hugh who flew back from Melbourne for the day during such a busy time,’’ Hart said. “Many punters often have a discussion about who was the best horse or best jockey so this project also promotes that debate. Back row L to R: K.Moses (TJ Smith colours), Hugh Bowman (Winx), Darren Beadman (Octagonal), Tommy Berry (Unencumbered in honour of brother Nathan Berry), Ron Quinton (Marscay). Bottom row L to R: Clark Little (Lord Fury, deputising for Ray Selkrig), Malcolm Johnston (Kingston Town), Kevin Langby (Gunsynd), Bill Camer (Hay List colours).